3. If your coffee maker completes it's brew in less than five minutes, use a fine grind-- finer than granulated sugar. If brew time is between 5-8 minutes, use a medium grind -- about that of granulated sugar. If brew time is longer than 8 minutes, use a slightly coarser grind. (You might want to run a full pot of water through your coffee maker and time the total brew time if you want to get serious about it.) Experiment with grind fineness until you're happy with the strength. 4. 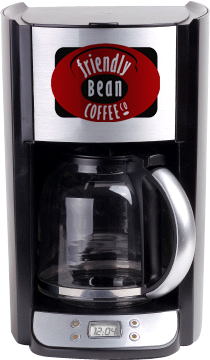 Drink it immediately or transfer to a thermos, thermal carafe, or insulated travel mug that does not add heat. One of the biggest problems with home coffee makers is that the heating plate bakes the coffee and after as little as 15 minutes on the plate, the flavors begin to deteriorate.